No recipe demonstrates this better than the Peanut Butter Bran Thingy, a shorthand term my family uses for a Pyrex dish full of ugly magic that continues to test my willpower to this day. 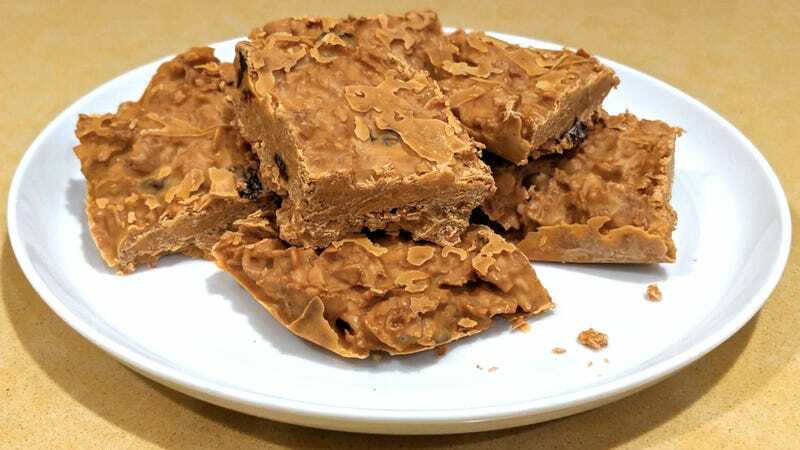 Lacking both a name and a discernible origin, these dessert bars seemingly crept up out of the primordial ooze, and they look every bit like they’ve made the journey. All three ingredients are varying unappealing shades of brown, and the lumpy final result resembles something you’d find on the pavement outside a Division Street bar the morning after St. Patrick’s Day. But in spite of it all, these Thingies succeed: Their satisfying cereal crunch alternating with pockets of rich smoothness unlocks something deep in the reptilian brain, with the power to pull a “gotcha” on even the most skeptical guests hesitant to bite into this gnarly-looking treat. Everyone should make these at least once, if only to reaffirm that looks can be deceiving, beauty is only skin-deep, and that one man’s Raisin Bran is another man’s treasure. Melt the butterscotch chips in the microwave or using the double-boiler method over the stove. Add roughly 1 cup of peanut butter (more or less depending on your desired ratio of flavors). Once the mixture is smooth, add fistfuls of Raisin Bran, crunching them slightly in your hand as you drop them in. Continue until the wet ingredients have distributed evenly over the Raisin Bran; none of the cereal should be dry. While you will end up using several cups of cereal, don’t put in so much that you’re left with a loose, unbound mixture. Basically it’s the same rule that applies to Rice Krispie treats. Using a rubber spatula, lightly press the mixture into a 9-by-13 Pyrex baking dish (or other high-walled pan of similar size) and refrigerate for at least 4 hours. You’re not going to get tidy, picturesque squares with these, so just slice off some nice snackable chunks and keep them refrigerated when you’re not eating them. Caution: some crumbling may occur.